I bought her a similar one and she doesn’t know the difference. My daughter, 2 years of age, lost her favorite toy yesterday. She has had it since she was a baby. She brought him everywhere with her – Turkey, America – she wouldn’t go anywhere without him. 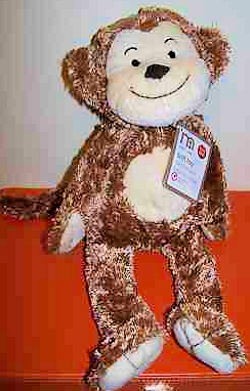 It’s a brown and cream Mothercare monkey. I told her that he went on holiday, but I’m devastated that he’s gone. We’ve put up posters around the area to see if someone will hand him in.